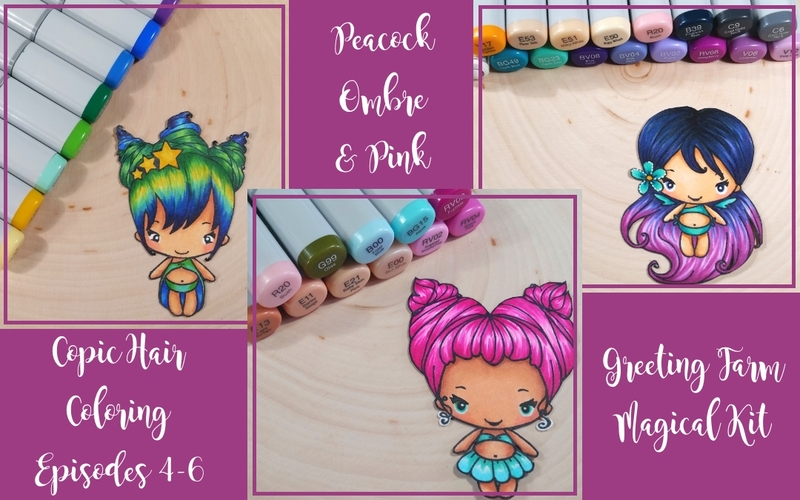 I have been asked by lots of folks to share how I Copic color hair so I thought in conjunction with Kathy Racoosin’s 30 day coloring challenge, I would put together a little Copic coloring YouTube series. The following are the second 3 episodes. The first 3 are HERE. The fourth through sixth images I colored were all from The Greeting Farm stamp set called Magical. I colored up the fourth cutie to have peacock colored hair using the following Copic skin colors: E51, E21, E11, and R20. Her hair and outfit are colored with Y11, Y15, BG32, G14, G17, B24, B28 and V09. For episode five, I colored up another cutie to have ombre hair. I LOVE this color combination! I used the following Copic colors to color her up: E50, E51, E53, R20, BG23, BG49, and Y17. Her blue-black to blue-violet to red violet hair is colored (from bottom to top) with V12, V06, RV66, BV02, BV04, BV08, C6, C9 and B39. For the sixth episode I colored up a girl with bright pink hair using the following Copic colors: E00, E21, E11, E13, R20, G99, B00, and BG15. Her hair is colored with RV02, RV04 and RV09. Next in this Copic coloring series, I plan to demonstrate coloring any color hair with dark gray shadows, how to color fur two ways, easy skin coloring, and coloring finishing details. I hope you are enjoying this series, and if you have any suggestions or questions about any Copic coloring you’d like to see me try, please let me know in the comments. Your work is so amazing Kristina and I am becoming a “glutton” for your Copic videos. They are so helpful that I am pinning them ALL! Thank you for producing such helpful videos!